If you're a frequent visitor to my blog, you know by now that I LOVE the method of braising meat in a big heavy pot in the oven. It seriously makes the meat fall apart tender, and it makes the whole house smell like Mom's home cookin'. What's not to love about that??? 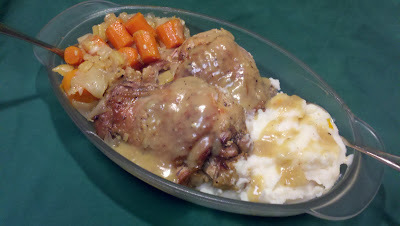 Not too long ago, I made Apple Braised Turkey Thighs and they were absolutely FANTASTIC. I had another package of thighs in the freezer, so I decided to do them again and try something new at the same time. Once again, I went with what I happened to have in the pantry, and this was the result. Now, I know the title of the recipe might lead you to believe that it's all sweet and sticky, but really it's not. The thyme in the poultry seasoning balances with the sweet ingredients and you end up with a savory thick gravy with just a few hints of sweetness here and there. I can't even begin to tell you how fabulous it is! I know I always say "this is one of the best things I've ever made" but seriously this is one of the best things I've ever made!!! I KNOW you'll love it!!! Trim excess skin from turkey thighs and season both sides with salt and pepper. Pour olive oil into a heavy pot or Dutch oven over medium high heat. Add thighs to pot, skin side down, for about 8-10 minutes, until the skin is golden brown. Turn the thighs over and cook for 5 more minutes. Remove thighs to a plate. Add onions and carrots to the pot. Saute for about 5 minutes until the onions begin to soften. Add garlic, pineapple, bay leaves, poultry seasoning, and honey. Give everything a good stir. Add broth and sherry. Nestle the thighs back into the pot, including any juices that have accumulated on the plate. Cover the pot, then place it in the oven for about 2 hours. After the two hours, it's time to make the gravy. Using a slotted spoon, remove everything from the pot to a serving platter, leaving the broth behind. Mix flour into cold water, stirring to make sure there are no lumps, then add it to the pot over medium heat. Stir until it thickens. Adjust seasoning by adding salt and pepper if needed. Pour the gravy over the turkey thighs. Serve with mashed potatoes. When you brown the turkey thighs in the pot, just leave them alone. They won't brown properly if you muss and fuss with them. If you don't have chicken broth, just use plain water. I used dry poultry seasoning, just because I had some handy, but I think fresh thyme sprigs would make it even better! If you don't have dry sherry, use white wine or even a splash of vinegar, or simply omit it!